Planning permission for driveways affecting the installation of non-permeable paving to the front of properties was introduced on 1st October 2008 in response to a number of factors. These factors include the increasing density of housing stock in many towns and cities, greater car ownership (which resulted in homeowners converting their front gardens into car parks) and potential climate change – all of which could increase the extent of localised flooding. 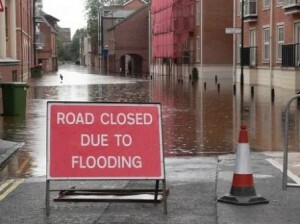 Whether you agree with the effects of global warming and climate change or not, something had to be done about the apparent increasing incidence of localised flooding and planning permission for driveways was introduced. We can do little about the amount of rainwater falling on our homes, gardens and driveways, so regulations and planning permission for driveways were introduced to deal with water run-off from driveways onto the public highway. The basic rule is that you will NOT need planning permission for driveways if you use a porous or permeable surface material which allows water to drain through it. 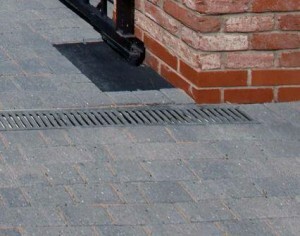 Such materials often require a different type of sub-base which will also allow drainage through its depth. NEITHER will you require permission for driveways if rainwater is directed from the surface of the driveway so that it drains through a lawn, border or soak-away naturally. The intention of the regulations is not to force everyone to make a planning application. Rather, it is to encourage homeowners to deal with their surface water by diverting it to the water table slowly instead of to the highway where it could contribute to a localised flooding problem. The obvious solution, if you want to install a non-permeable surface (such as most types of tarmacadam, concrete and block paving) and your driveway slopes towards the highway, is to install aco drainage at the driveway entrance which takes surface water to a new soak-away. 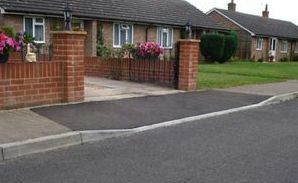 This way you can avoid the problems associated with planning permission for driveways. Planning permission for driveways only refers to new surfacing to the front of properties, not the side (unless you live on a corner and the side of your house fronts the highway) and not to the rear. Elsewhere on your property, planning permission for driveways and patios could apply where you intend to create terracing or embankments to support a hard surface. Planning permission in respect of non-permeable driveways only applies to houses in England and different rules may apply to flats, maisonettes, listed buildings and conservation areas in England, and to all properties in Wales and Scotland. In the vast majority of situations, surfacing for a new driveway or patio area is not subject to Building Regulations approval but there is a general rule that access to the house should be no worse than it was prior to any alterations. For example, if you currently have a ramp up to your front door, you should not replace it with steps. Additionally, if there are several steps up to either an access door into the property or to a raised area, you may need to install a balustrade to the side of the steps to comply with Building Regulations. Rules for both planning permission for driveways and building regulations are under constant review by the authorities and we only provide general guidance here. For up to date information which applies to your specific circumstances we advise you to contact your local planning office or building control department. The growth in car ownership and the lack of on street parking has resulted in an increase in the number of homeowners wishing to convert their front gardens into parking areas. Converting a soft landscape such as a lawn into hard standing has obvious implications with regard to planning permission for driveways (see above), but there is another issue to consider – that of access. Some pavements can be 150 mm or so higher than the adjoining road and driving over them can cause damage to the underside of your car. It could also cause potential damage to pipework underneath the pavement which was never intended to take the weight of a vehicle. Dropping the kerb down to the level of the road involves lowering the kerbs, (with rising kerbs either side), creating a slope from the road surface to your driveway entrance and strengthening the pavement surface between the two. Permission needs to be sought from your local authority to drop a kerb down to road level as it is their responsibility for maintaining most public highways. Some local authorities and councils have their own staff to carry out the work involved in dropping kerbs and are happy to quote you for the work. As part of the application to drop a kerb, you will need to submit drawings outlining your proposals and pay a fee, but there is no guarantee that planning permission will be granted. If planning permission is granted, the local authority will provide full specifications of the work to be carried out and may make a visit to inspect whilst the work is being carried out. Dropping a kerb without planning permission can result in a fine and the cost of returning the pavement and kerbs to their original state. You could also be held responsible for any damage to pipework and services buried under the pavement.